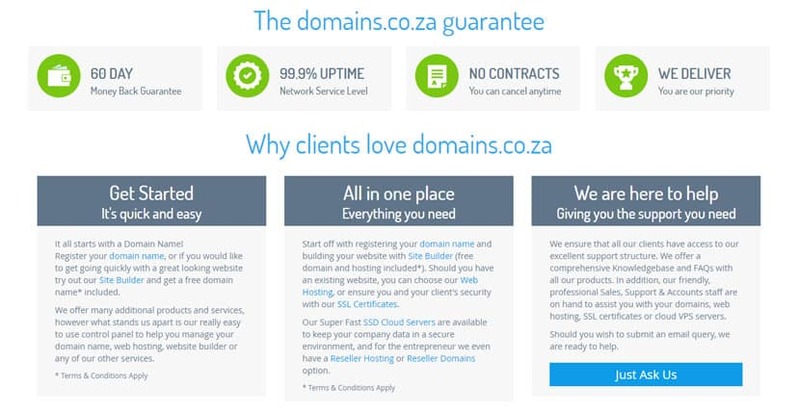 domains.co.za Review 2019: Is domains.co.za a Good Hosting? Domains.co.za is a South African company with almost two decades of experience in the web hosting industry. They provide a variety of hosting plans and other online services to both individuals and businesses. Domains.co.za was founded in 2012 by DiaMatrix, an internet service provider that’s established a solid reputation since their inception in 2001. Their parent company’s field of expertise includes everything from domain name registration and hosting to internet connectivity, bulk emailing, and other IT solutions. The main focus of Domains.co.za is to provide their customers with white-label multi-registrar solutions — their target clientele are other ISPs and South African companies who want to offer domain name reseller services. Domains.co.za was actually originally designed as a white-label ICANN-accredited domain registrar, so their web hosting solutions are sort of an afterthought. That said, one of the perks of purchasing a hosting plan from a domain registrar is that you get a free domain registration with your package — although you’re limited to .co.za, .xyz, .org.za, .net.za, and .web.za extensions. Even though their focus is on domain registration, their web hosting packages aren’t too shabby. All shared hosting packages are backed by a 99.9% uptime SLA, and your website is hosted on a network that’s IPv6 ready. On top of that, their servers are located in Johannesburg, South Africa, so your website will be ideally situated to cater to a South African customer base. You’ll also get access to a one-click app installer with over 260 available applications, a decent number of email accounts and databases in every plan, lightning-fast SSD storage, weekly backups, and the latest version of cPanel. Sadly, none of their plans include free SSL certificates; you’ll have to pay an extra sum for this. Their cloud hosting packages take your website a notch further with a 99.99% uptime guarantee, heaps more SSD storage and bandwidth, IPv4 and IPv6 connectivity, and free monthly backups. The last feature was an odd choice and seemed like a step backwards, considering that their shared hosting plans offer weekly backups. What’s interesting is that there are no contractual obligations; you’re free to cancel your hosting account whenever you want. They also have a “no overselling” policy with their cloud hosting servers, so you can rest assured that your website will actually be able to use the resources you’re promised. Prices are displayed in the South African currency, which means you’ll have to do a bit of mathematics to fully understand their offers. This company accepts a variety of payment methods with only monthly subscriptions available — interestingly, they don’t include any major discounts on longer contracts, which is pretty uncommon. All in all, their offers are generally some of the lowest in the market, which makes them a highly attractive option. This is on top of their 60-day money back guarantee and lack of contractual obligation. One thing you may have to watch out for though: because you’re billed on a monthly basis, you have to make sure you pay your bills on time. If you fail to pay or renew your monthly subscription, your account may be terminated and your backups deleted immediately and without prior notice. This was a pretty harsh measure, in my opinion — sometimes people are a little forgetful, after all. While checking out their customer support, I found a highly-organized and easy-to-use knowledge base, which provided me with answers to the most frequently asked questions. Their support team officers show dedication and professionalism in their line of work: each ticket I submitted had an average response time of 20 minutes, and their phone support hotline was open around the clock. Another large plus for the company is their cloud VPS SLA, which covers a wide range of services. I found the services of this South African company highly affordable and reliable. Everything you need for your online business is obtainable at some of the lowest prices on the internet solutions market. Wondering how domains.co.za stacks up against other Web Hosting companies? Enter any other Web Hosting company and we will give you a side-by-side comparison.